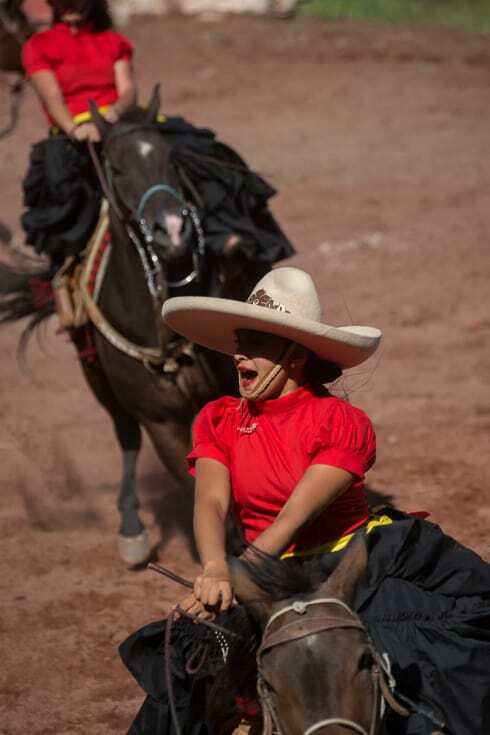 In Mexico, the land of a thousand fiestas, even the cowboys get their own national holiday. 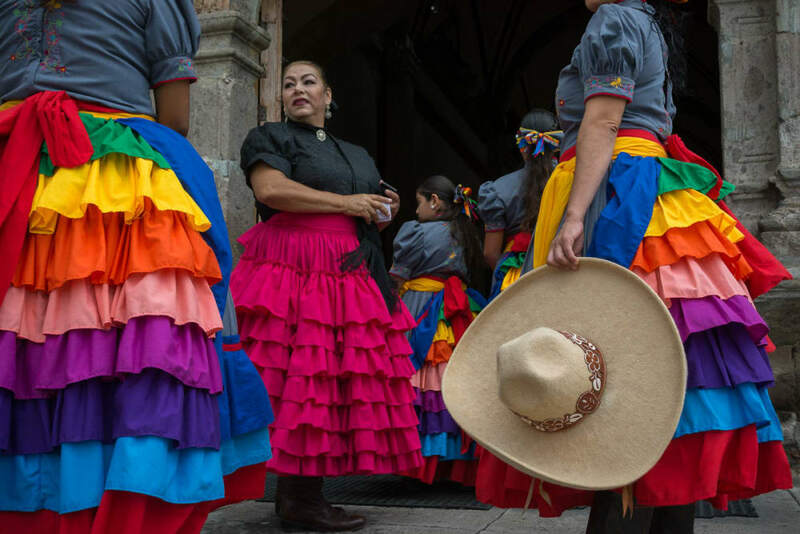 In Mexico, where there are more saints (official and unofficial) than days available on the liturgical calendar, every day is a fiesta somewhere in the country. Even the cowboys have their own holiday. 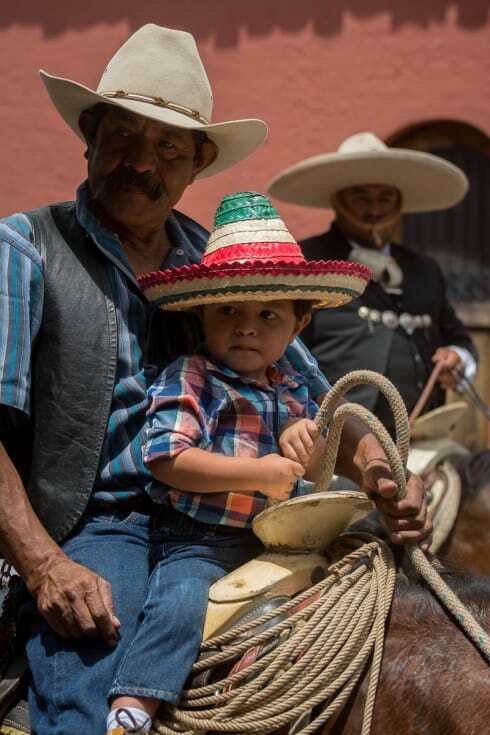 El Día del Charro — the Day of the Cowboy — is observed every September 14 in the bullrings and streets of pueblos and cities across Mexico. 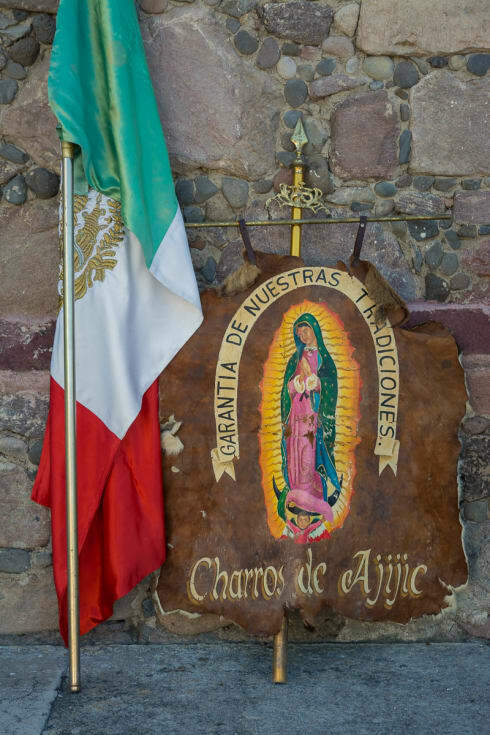 In Ajijic, though, the Day of the Cowboy is always observed the Sunday before Independence Day. The day starts with a specially themed mass at the reasonable hour of 11:00 a.m., when one-by-one or in small groups the cowboys begin to trickle in from their houses throughout the pueblo. While the mass goes on, a loudspeaker carries the priest’s words to the cowboys who have gathered on their horses in the courtyard. Then there’s a traditional desfile parade through the town and when it’s over, everyone ends up at the bullring for lunch and an afternoon of games, competitions, drinking and socializing between cowboys. This month, UNESCO added the Mexican sport-art of charrería to its Representative List of the Intangible Cultural Heritage of Humanity. 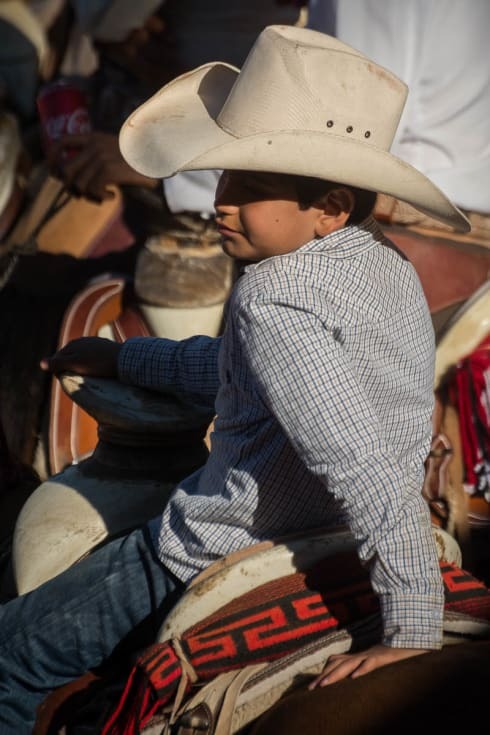 Cowboys get a bull ready in the pen so it can be ridden in the bullring in Ajijic, Jalisco, Mexico, on El Día del Charro, the Day of the Cowboy. A cowboy and an escaramuza cowgirl use their sombreros to keep the sun off their faces while they wait outside a church for the Day of the Cowboy mass to end. The day starts off with a cowboy and animal-themed mass as the cowboys begin to gather outside the church on their horses. People overflow the church and wait outside during the Day of the Cowboy mass in Ajijic. 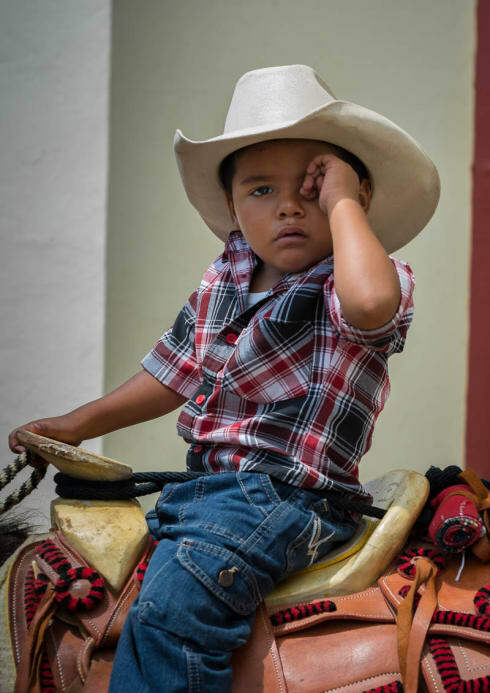 A little cowboy wipes the sleep from his eyes while waiting for the late-morning mass to end on the Day of the Cowboy. A boy rides along with one of the cowboys. 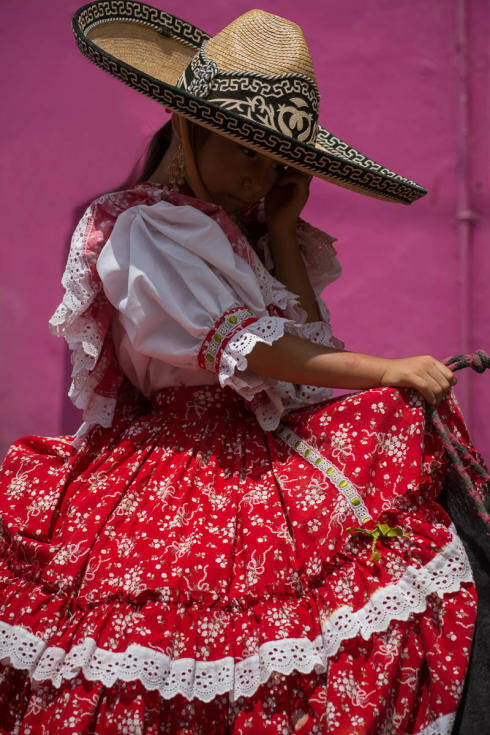 Escaramuza cowgirls wait in their colorful dresses to enter the church before the Day of the Cowboy mass. Two niños watch the cowboys arrive at San Andrés church for the 11 o’clock mass. 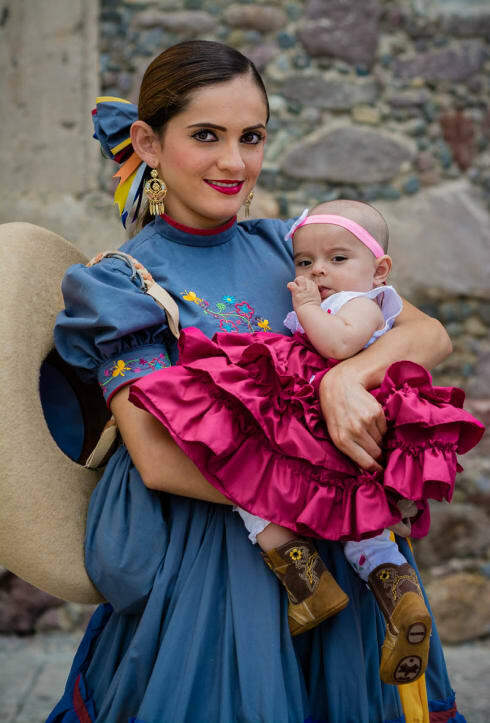 An escaramuza cowgirl holds her baby on el Día del Charro in Ajijic, Mexico. 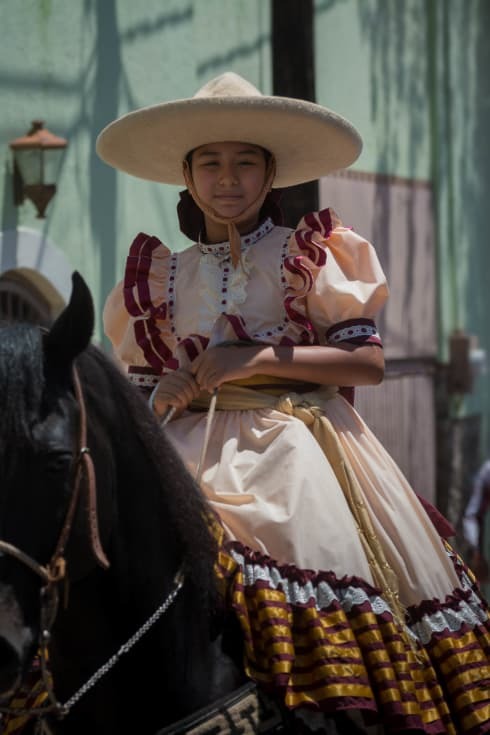 An escaramuza cowgirl during the parade. 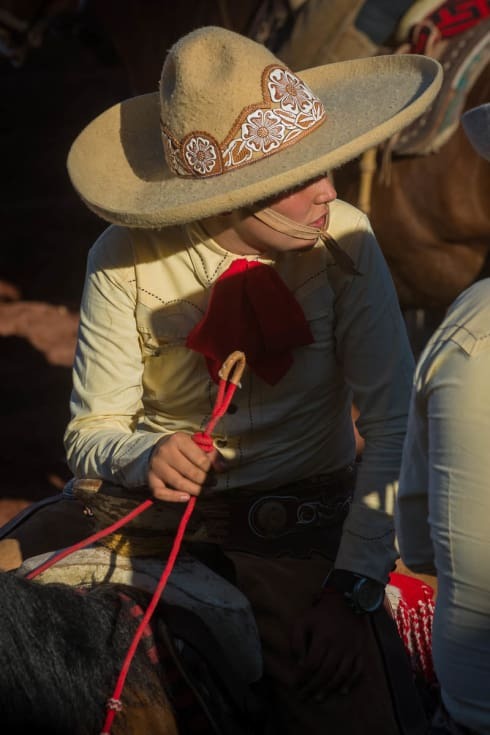 Young escaramuza cowgirls help each other with their sombreros. 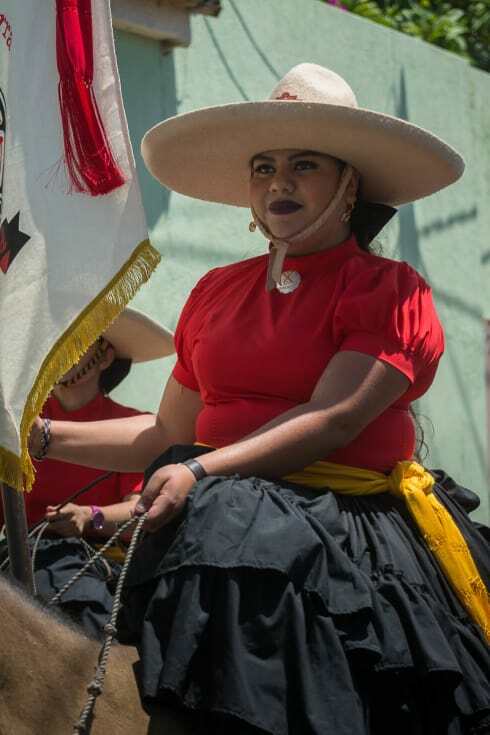 Rosaura Prieto López holds the escaramuza team’s flag during the parade following the mass in San Andrés church. Cowgirls leave the church after the Day of the Cowboy mass in Ajijic, Jalisco. A bull skids on its back after being flipped over during one of the charrería competitions held in the Ajijic bullring on El Día del Charro. The hundreds-year-old sport-art has deep roots in the state of Jalisco. A cowboy plays a game of darts (left hand), which consists of galloping full charge, screeching to a halt and performing a 180 degree turn, then galloping back in the opposite direction a short distance to throw the dart into a bullseye. 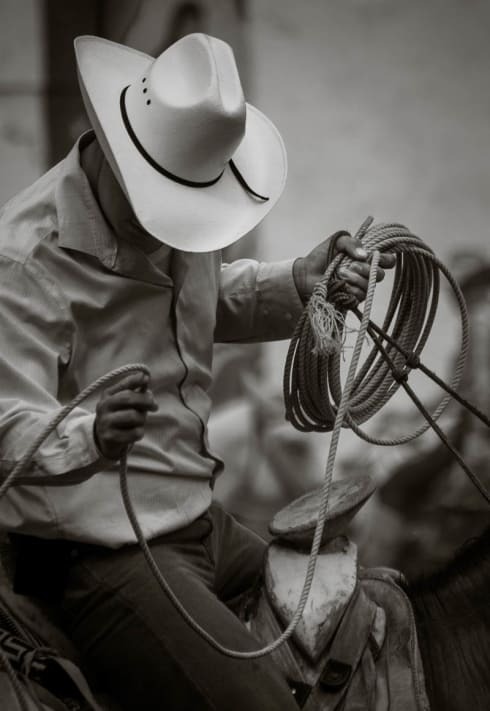 A cowboy practices his roping skills in the bullring. A child peers out from the upper stands of the bullring to take in a view of the action unfolding below. 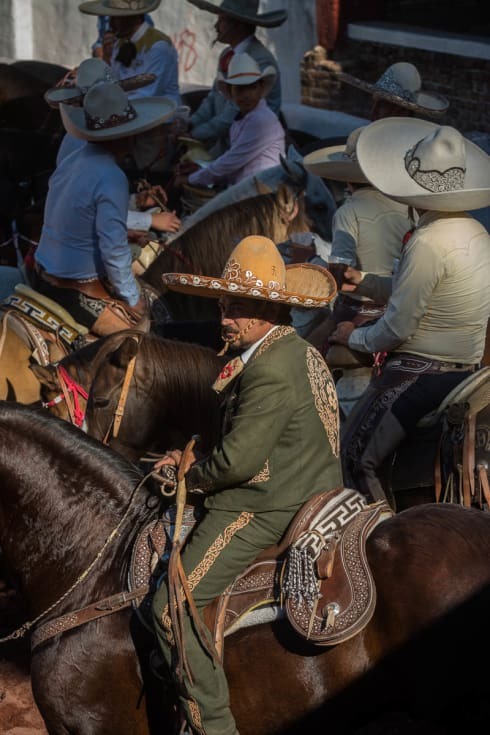 Cowboys gather ’round on their horses to drink and talk outside the bullring on the Day of the Cowboy in Mexico. 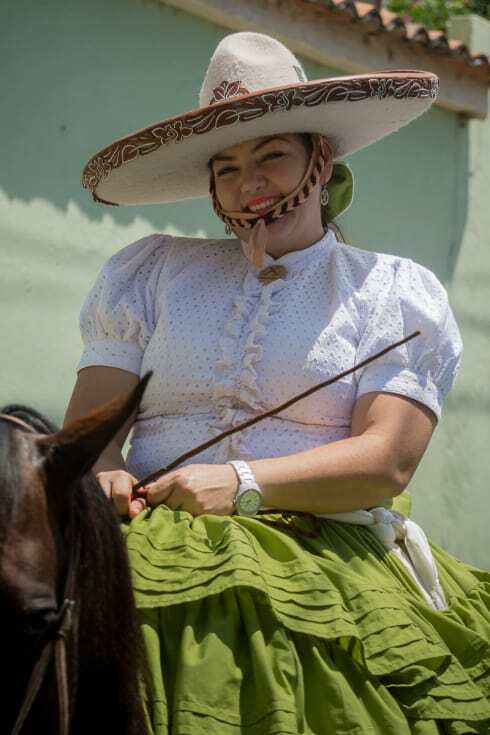 Gaby Gucho on her horse during the Día del Charro parade. 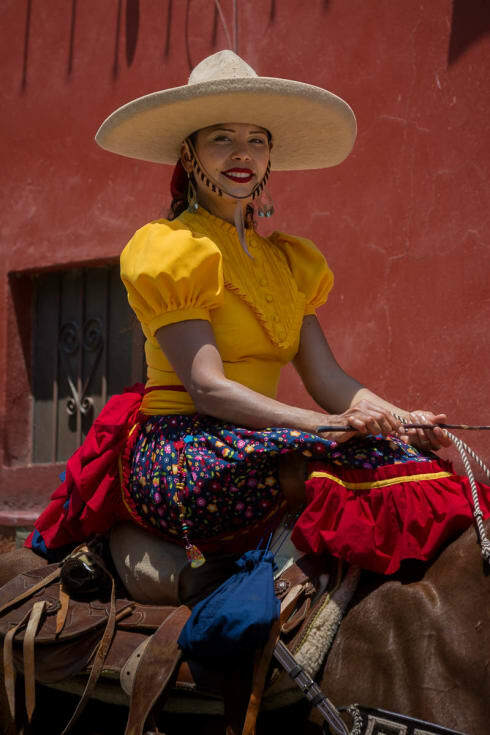 Escaramuza cowgirl Minnie Kleine on el Día del Charro in Ajijic, Jalisco, Mexico. 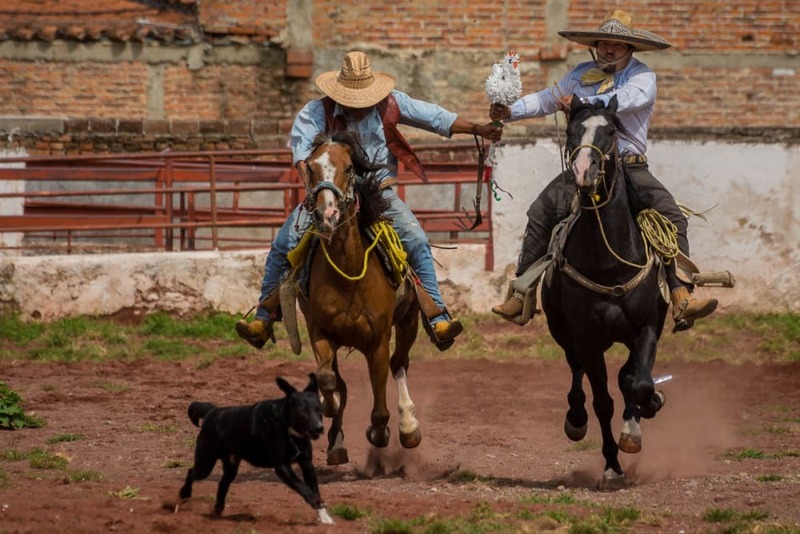 Events at the bullring during the Día del Charro include the game of “chicken.” Two cowboys on horses start off standing still, both clutching a baton dressed up as a chicken. Then they charge ahead at full speed. Whoever ends up hanging on to the “pollo” wins the round. 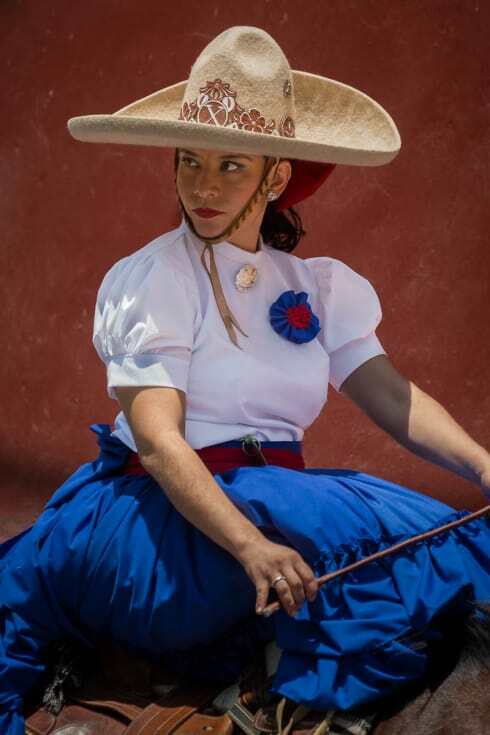 A charro throws a lasso during a charrería performance on the Day of the Cowboy in Ajijic. Roping demonstrations are given during competitions using bulls and unbroken horses. 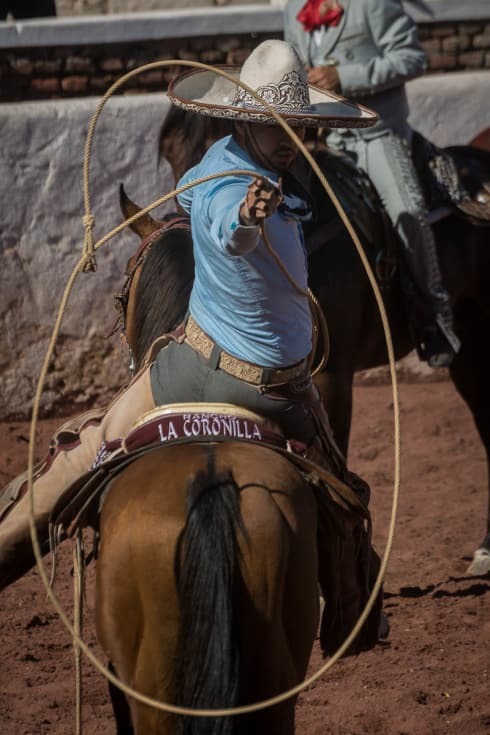 An escaramuza cowgirl gives a vocal signal to the rest of her team during a performance on the Day of the Cowboy. A vendor uses a blade to slice fried pig skin into small bags for sale to attendees in the crowd watching the events on the Day of the Cowboy. People use their hats to keep the sun off while watching the games underway in the bullring. 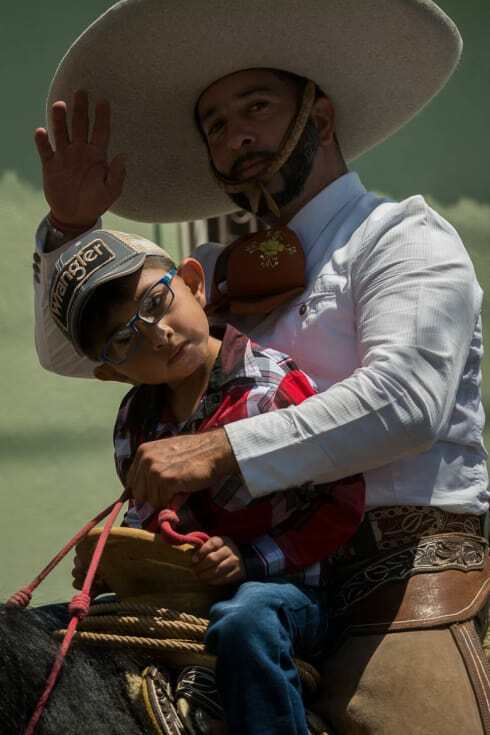 An escaramuza during the Day of the Cowboy parade in Ajijic, Jalisco, Mexico. 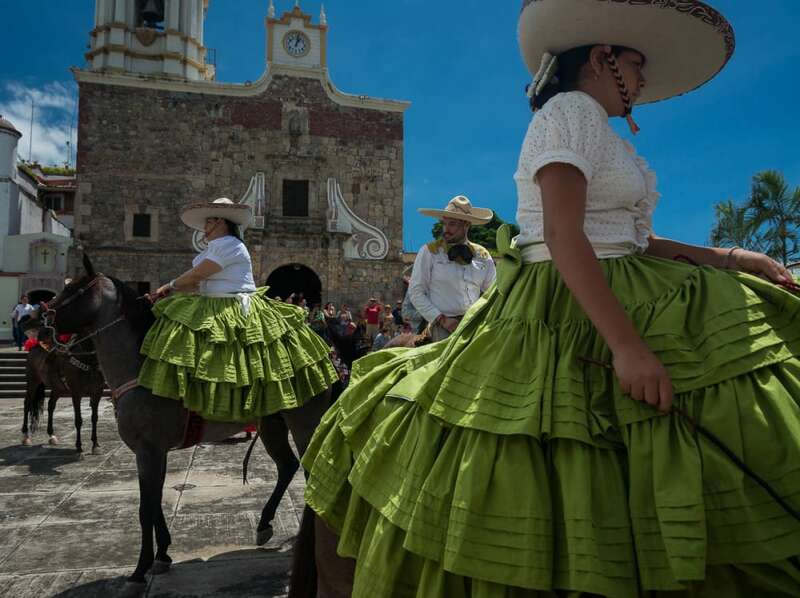 The holiday will often bring escaramuza teams from nearby towns or Guadalajara, about an hour away. Viridiana García Mariscal takes part in the parade for El Día del Charro in Ajijic, Mexico. After the parade, the cowgirls and cowboys eat a lunch of birría, a local specialty made of spiced goat. Cowboys linger after lunch to talk before the afternoon’s charrería competition in Ajijic. 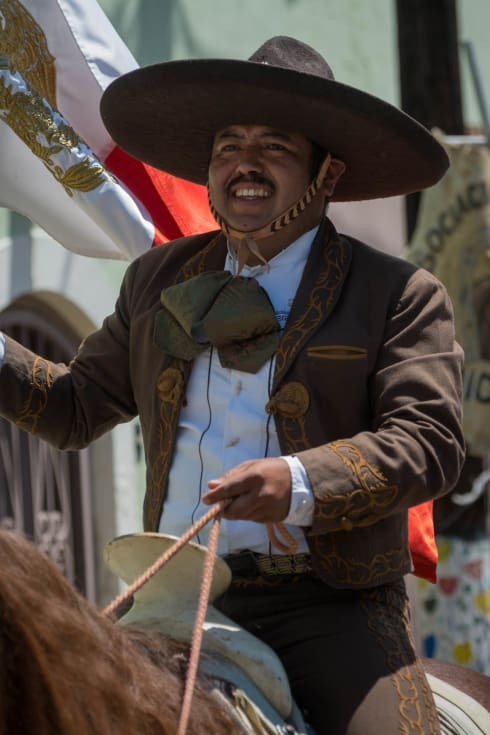 Juan Flores, president of the Ajijic Association of Charros, holds the Mexican flag during the parade on el Día del Charro. Everyone can be a cowboy. 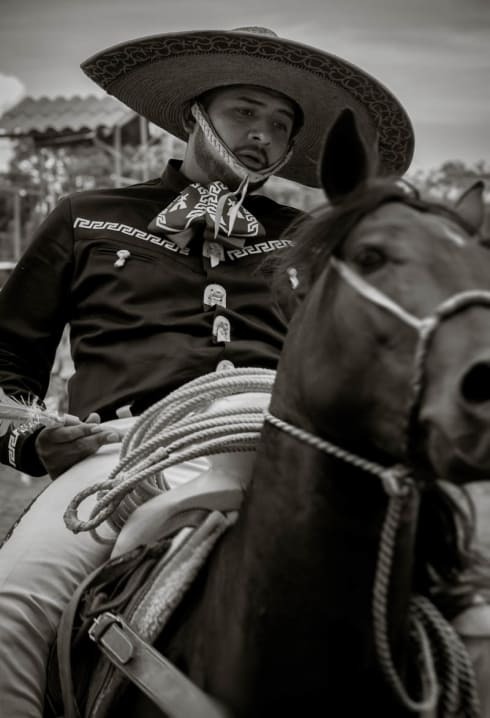 A cowboy’s sombrero and traditional charro dress. Cowboys in the light of the late day at the end of celebrating the Day of the Cowboy. 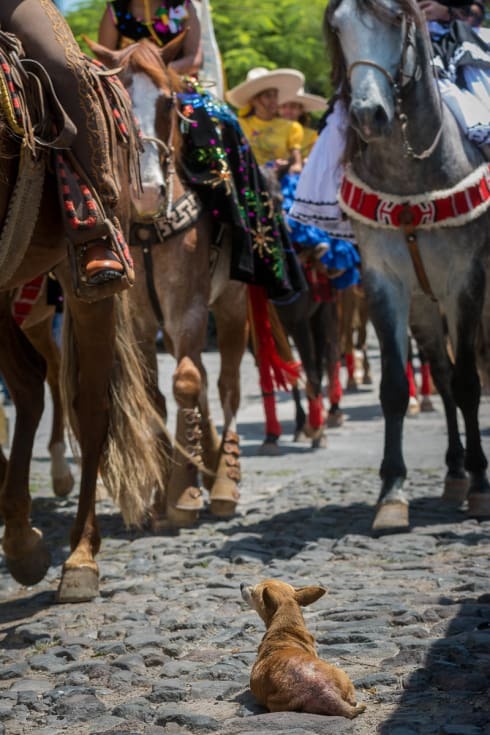 A chihuahua refuses to back down from a passing group of horses during the parade on El Día del Charro. This little guy appeared to have a mild case of mange, but when I saw him again a few weeks later he was fine. A horse saddle after the parade around town ending at the bullring. A young cowboy congregates with other cowboys at the end of the day. A cowboy watches the others try to rope horses. A boy practices how to use a lasso before the afternoon’s games and demonstrations begin on the Day of the Cowboy.